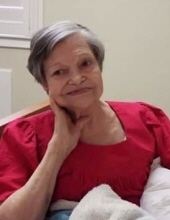 Helen Marie Miller, daughter of the late Homer Lee and Cornelia (Stout) Bradshaw, was born August 12, 1935, and passed away April 11, 2019, at Cherry Ridge Skilled Nursing Facility in Bastrop, Louisiana. She was 83 years, 5 months, and 30 days of age. Helen grew up in the Norwood community. When she was a young girl, she walked 2 ½ miles to the Assembly of God Church in Norwood to build a fire in the wood stove, so the church would be warm for services. The Lord healed her when she was a child. The doctor sat with her waiting for her to die but God healed her. Helen was a homemaker most of her life and loved taking care of her three children, Myra, Sharon, and Alvin. She also enjoyed taking care of other people’s children in her home and cared for many throughout the years. Helen also had a heart for the elderly and enjoyed visiting them and helping when she could. Besides her parents, Helen was preceded in death by three brothers, Cecil Bradshaw, Paul Bradshaw, and Jesse Bradshaw, two sisters, Lorraine Miller and Jewell Dodson, and by one grandson, Justin Whiles. She is survived by two daughters, Myra Raney of Bastrop, Louisiana, and Sharon Beresford of Ottawa, Kansas, one son, Alvin Raney of Ottawa, Kansas, one sister, Betty Raney of Merriam, Kansas, ten grandchildren, 24 great-grandchildren, and many nieces, nephews, and other relatives and friends who will miss her dearly. To send flowers or a remembrance gift to the family of Helen Marie Miller, please visit our Tribute Store. "Email Address" would like to share the life celebration of Helen Marie Miller. Click on the "link" to go to share a favorite memory or leave a condolence message for the family.